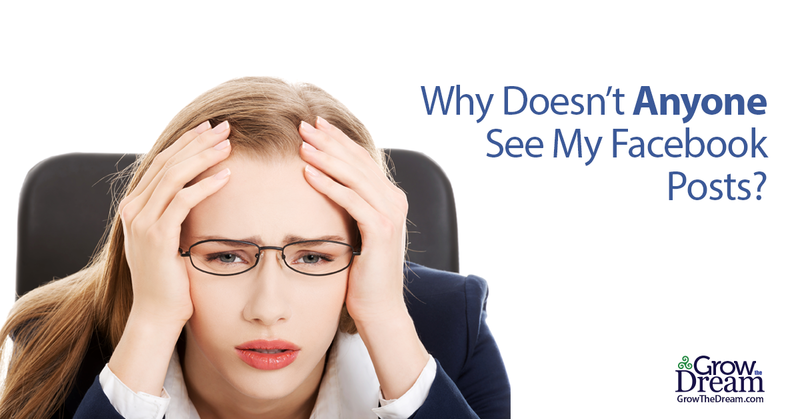 Why Doesn't Anyone See My Facebook Posts? You’ve got your Business Facebook Page set up. You’ve put the effort into getting it all decked out with a nice profile pic and a timeline cover. You’ve even built up some followers (Hallelujah!). Now it’s time for the post. You set aside a few minutes, crank out a nice little status update, maybe even upload a picture to go along with it. You wait for that juicy little moment of validation. Will it be a comment? Who will “Like” it first? Maybe someone will think it’s useful, entertaining, or interesting enough to “Share” it! But you’re too busy to sit in front of Facebook and wait around for meaningful interaction with your content. So you get busy with other things. After an hour or two, you come back and check the stats on the post, only to find that your post reached 10 people. The fact of the matter is that Facebook told us this was coming. And as Facebook has shown content from Business Pages less and less frequently, their own advertising sales (and stock price!) have skyrocketed. You’ve no doubt been shown plenty of opportunities to “Boost” your content by paying for visibility, and it’s hard to not be cynical about the situation. What used to be free now comes with a price. Should I Even Bother Posting to My Facebook Page Any More? The lack of “organic” (read: unpaid) reach on Facebook has left many small businesses wondering if it’s even worth the time or energy to bother posting to Facebook any more—especially if you haven’t set aside any budget for Facebook ads. But with a little time spent developing a strategic plan, Facebook can still be a fantastic way to reach your best audience: your existing (and/or past) clients and—perhaps even more importantly—their peers. This leads me to the number one problem I see with social media marketing when it comes to business owners and their teams: the strategy. You’ve probably heard me say it before (and this won’t be the last time), but you must have a strategy to be successful. Who: Who are you marketing to? What do you know about your “ideal” customer? What’s going on in their world today? What: What problem(s) do you solve for them? What value does that add to their lives? What are the benefits of doing business with you… for them? How: How can you package the value you bring and the benefits you add to your customers in a way that connects with them… emotionally? Armed with your cheat sheet, here are some ways that you can improve the reach of your Facebook Page—with or without spending money on Facebook ads. When In Doubt, Inspire & Encourage. Let’s face it. Life can be hard. Everybody can use some inspiration and encouragement sometimes. The old adage says that people do business with those that they know, like, and trust. If you encourage me at a time when I need it, I’m going to remember you, I’m going to like you, and I’m more likely to trust you.Don’t know where to start? If you need a source of encouraging or inspiring content, check out Zig Ziglar, Nourish The Dream, and Gary Keesee Facebook Pages. Don’t hesitate to share their content to your page! Use Video. A few months ago, Facebook implemented an “autoplay” feature that causes video clips to start moving without the user having to hit the “Play” button. You could argue that the “Ice Bucket Challenge” would never have taken off without this feature. But when you see something interesting (or unusual!) moving by you on the screen, it can be hard to resist.Today, video is easier than ever. Virtually every smartphone on the market today is capable of producing great quality video without a lot of effort. Get someone to hold it up for you, and start talking. Keep it short, sweet, interesting, and valuable. Upload it to YouTube first (using your smartphone’s YouTube app) or directly to Facebook. These are some quick ways to increase the level of visibility for your Facebook content. I hope you find it useful! If you have questions, leave a comment here or contact me on the web, on Twitter or on Facebook and I’ll do my best to tackle your question in a future post! Thanks so much for that. Has given me some great ideas already! Bless you. You’re most welcome, Janet! Thanks for visiting and for taking the time to comment! So Good! So Many Great Tips! I will but your advice to work rite away! Thanks! I’m glad you found this useful, Brian! Hope you get good results with it! this matter to be actually something which I feel I would by no means understand. me. I am taking a look ahead for your subsequent submit, I will try to get the hold of it!